On November 9, under the auspices of the Fund Ardza, Mr. Aieti Kukava, CEO of Alliance Group Holding awarded the top three students enrolled in corporate social responsibility course at the Caucasus University. 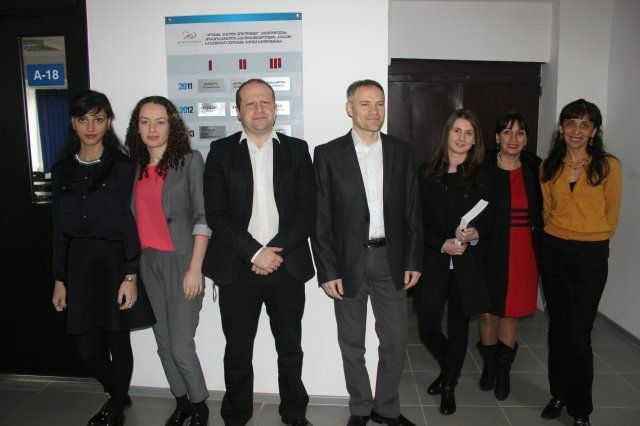 According to the MOU signed between AGH and Caucasus University, the event has been held for the past three consecutive years. The first two places were divided among two students, Nino Melkadze and Nino Rekhviashvili. They received scholarship for 500 GEL from the company, the third place went to Miranda Surmanidze, who received 200 GEL. The students received monetary awards and books on corporate business ethics from AGH. In addition, within the framework of partnership, the students were given an opportunity to complete 3-6 months internship program at the Alliance Group Holding and its affiliated companies with the future employment perspectives. “We are very proud to participate in this initiative, since promoting ethical business principles among youth is one of the key directions within our corporate social responsibility strategy. . It is essential to show the importance of doing business ethically to students, to demonstrate what benefits ethical business has on company’s future success and how it contributes to the overall economic development of the country. We strongly believe investing in the young generation is key to success as they are the future of the country”, - declared Mr. Aieti Kukava. The nominative stand with the names of the students was officially opened after the award ceremony for their longstanding recognition.